Air freight: Since the transit time is of prime importance in air freights, we sketch out proper plans for every client so that all the requirements put across by the clients are met, within the stipulated time. Be it transportation of hazardous cargo, customs clearance, import or export consolidation, we fulfill all your needs and at the end of the day your expectations are transformed into reality. The tracking system lets you keep a hawk's eye on the progress of the transportation process. All sorts of queries are handled effectively by our customer care team. 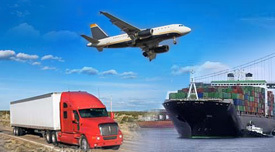 Sea freight: Our clients vouch for our effective and affordable services of sea freight. With the strong network of our partner companies, it is the client who can relish the rich dividends of availing services which are structured to suits their specifications and their schedules. From the instant you state their requirements to the last stage of the delivery of your goods, we take immense care of the entire transportation process and keep you informed about every development of the process. Services pertaining to full loads cargo or less than container loads, custom clearance along with facility of tracking are provided by black sea cargo LLC which undeniably makes our client satisfied with the wide range of services offered by us. Rail freight: Rail freight has proved to be the most viable options for clients who want to dispatch freight which are large and heavy. The services are offered by our staffs who are highly motivated and they have garnered various accolades for their caliber in this industry and they make sure that the shipment is made on time while maintaining high quality. We have not created any limits on the size of your cargo which in turn will aid in choosing our services without worrying about the freight size. Our quality accentuates with every assignment we take up, resulting in fulfilling the needs of the clients. Containerized as well as non containerized items are also relocated by us. Inland haul: The experience in this industry has made it easier on our parts to comprehend the inland traffic system which as a result has equipped us to plan processes in such a fashion that the entire transaction remains affordable for our clients. Trucks are used for the transportation purpose. Cargos with a full truck load are assigned an entire truck for the transportation. When the sizes of the shipment are large in nature, low boy trailers are utilized to meet the needs of the customer.